Whether you’re a trained chef or simply enjoy cooking at home, there’s always a certain amount of trepidation at the thought of having guests for dinner. Do you go out on a culinary limb and serve something impressively daring, or do you play it safe with a tried and true menu? If you decide to take a chance, how daring are you? And, if your menu is an adventure for the taste buds, what wine do you pair with it? Recently, malbec received praise for being a versatile wine and a great choice for food pairing. In fact, when surveyed, more than half of culinary professionals agreed that malbec pairs with many types of foods. Whether you’re serving something wildly daring, such as five-spice crusted short ribs with miso black garlic jus, or something mildly daring, like rigatoni with spicy salami and tomato sauce, you can’t go wrong pairing it with malbec. 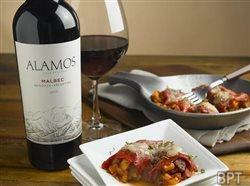 Alamos Malbec, America’s most preferred malbec, is grown in the foothills of the Andes Mountains in Argentina. The result is grapes that combine bold layers of flavor and excellent natural acidity for a wine that pairs beautifully with just about any meal. “Our unique growing conditions of intense sunlight and cool evening temperatures produce malbec grapes with incredible flavor making the wine highly versatile for pairing with food,” says Alamos Winemaker Felipe Stahlschmidt. Entertain with confidence by leaning on malbec’s versatility. Consider pushing the culinary envelope, and pair malbec with daring cuisine, such as this recipe for Manchego and Chorizo-Stuffed Piquillo Peppers. Your guests will be impressed (and your reputation in the kitchen preserved). For more daring pairings, visit www.tastingtable.com/alamos. Preheat oven to 450 F. Cook chorizo, onion and garlic in a large skillet over medium heat for 10 minutes or until onion is soft, stirring frequently. Stir in tomato, malbec, yellow bell pepper and seasonings and cook for 10 minutes more or until all excess liquid has cooked off. Stir in cheese. Fill piquillo peppers with equal amounts of filling and place stuffed peppers in a shallow baking dish. Sprinkle with additional cheese, if desired, and cook in preheated oven for 5 minutes or until peppers are hot and cheese is melted.